The Delux Cargo Liner from the All For Paws brand keeps the back of your car protected from stains and dog hair. The blanket is water-resistant and has Velcro that allows it to be fixed securely to the car. Because the blanket is universal it will fit almost any car. The Delux Cargo Liner from the All For Paws brand keeps the back of your car protected from stains and dog hair. 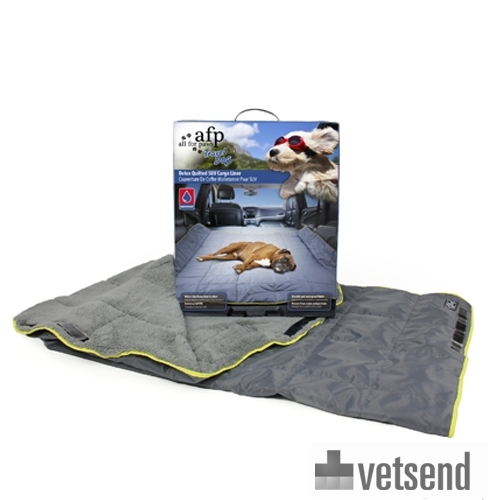 The blanket is water-resistant and has Velcro that allows it to be fixed securely to the car. Because the blanket is universal it will fit almost any car. The blanket has two different sides, allowing it to be used according to season. One side is soft and warm and perfect for autumn and winter, while the other side is cool and smooth and ideal for spring and summer. Have you used AFP Delux Cargo Liner before? Let us know what you think about this product.